PIRATES! TREASURE! ADVENTURE! The Treasure of the Caribbean is our giant (43' x 44') obstacle course. 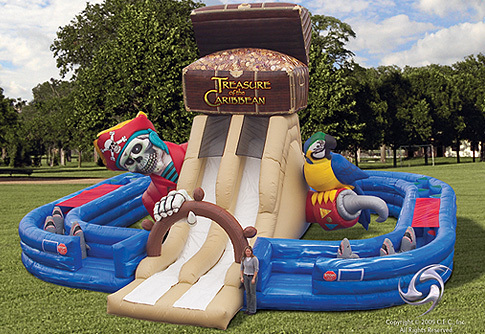 Your little pirates work through the obstacles, scale the climbing wall and end with a 22' slide, as the Pirate King and his faithful Parrot oversee the action. Dramatic and exciting the Treasure of the Caribbean is a welcome addition at any party.